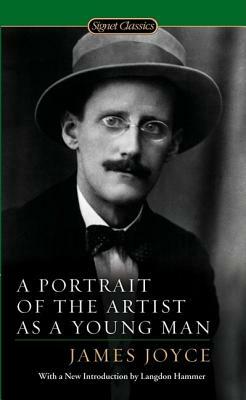 A masterpiece of modern fiction, James Joyce’s semiautobiographical first novel follows Stephen Dedalus, a sensitive and creative youth who rebels against his family, his education, and his country by committing himself to the artist’s life. “I will not serve,” vows Dedalus, “that in which I no longer believe…and I will try to express myself in some mode of life or art as freely as I can.” Likening himself to God, Dedalus notes that the artist “remains within or behind or beyond or above his handiwork, invisible, refined out of existence, indifferent, paring his fingernails.” Joyce’s rendering of the impressions of childhood broke ground in the use of language. “He took on the almost infinite English language,” Jorge Luis Borges said once. “He wrote in a language invented by himself....Joyce brought a new music to English.” A bold literary experiment, this classic has had a huge and lasting influence on the contemporary novel. Born in Dublin, Ireland, James Joyce (1882–1941) studied philosophy and languages at the Dublin College of the Royal University. He left Ireland in 1902 and went to Paris, but upon learning that his mother was dying, he returned to Dublin in 1903. After his mother’s death, Joyce taught school in Dublin and met Nora Barnacle, the woman who would be his lifelong companion. Joyce and Nora left Ireland in 1904 and traveled to Trieste, where Joyce taught languages at the Berlitz School. An attack of rheumatic fever in 1907 caused his vision to worsen throughout his life. Apart from one trip back to Dublin in 1912, Joyce spent the rest of his life on the Continent. Wealthy patrons subsidized his writing, and Joyce became the most influential novelist of the twentieth century. His writings include Chamber Music (1907), Dubliners (1914), A Portrait of the Artist as a Young Man (1916), Exiles (1918), Ulysses (1922), Pomes Penyeach (1927), and Finnegans Wake (1939). Langdon Hammer, author of Hart Crane and Allen Tate: Janus-Faced Modernism and numerous essays on modern and contemporary literature, is the chairman of the English Department at Yale University.